I stepped onto the crystal lake. Underfoot it was rock hard; I bent down and touched the surface nervously; it was cold, but not too frightening. It was not slippery, either, not like real ice. I nodded to Browneyes and she stepped down from her tussock, holding onto my hand. I remember thinking, with the ridiculous sentimentality of my age; if we go, we'll go together. . . .
We began to walk, treading lightly in order not to disturb the monster underneath, talking in whispers. After awhile we reached the far shore and followed a winding, glittering path among the spinethickets and reed. Wolff yelled again and suddenly I caught sight of him and Ribbon beyond a bush, about thirty paces away. 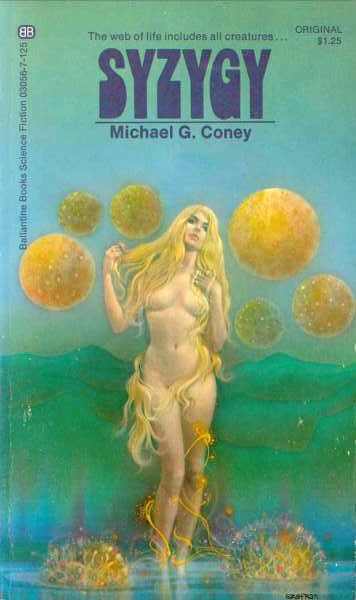 The name Mike Coney is no longer frequently heard in the science fiction world, but at one time his short fiction appeared steadily, most frequently in The Magazine of Fantasy and Science Fiction , and his novels were anticipated with enthusiasm by his fans. As with many excellent writers of his generation, his books are now mostly available through sources like Abebooks.com, BookFinder, and Amazon. They are worth searching out. Were another generation of readers to be treated to the workings of Mike's delightful mind, it would be a good thing. They would find well-drawn characters, quirky and thoroughly imagined science, vivid references to everything from Arthurian legend to alien cosmology to steam mechanics—sometimes all in the same book. And to paraphrase a fan, his tales have heart. Mike published eighteen novels and over sixty short stories in his lifetime. His works have been translated into Dutch, French, Russian, Japanese, and more. His novel Brontomek! won the British Science Fiction Association Award in 1976, and his novelette "Tea and Hamsters"  was nominated for a Nebula in 1995. Various of his works have been nominated for a total of five Aurora Awards. Born in Birmingham England in 1932, Mike and his wife Daphne have been publicans in England and hoteliers in Antigua. In 1972—the year that saw the publication of his first novel, Mirror Image —they moved to Canada, where he worked for many years with the British Columbia Ministry of Forests and ran Porthole Press. He died on the 4th of November, 2005. When Mike was diagnosed with terminal cancer last year, he dispensed with the usual hoop-jumping and placed three previously unpublished novels and five short stories on his website for free download. One of these, I Remember Pallahaxi , is the long-awaited and greatly satisfying sequel to his most popular novel, Hello Summer, Goodbye , named by the British Science Fiction Association as the best British SF novel of the '70s. Completing this interview was a difficult task for Mike. 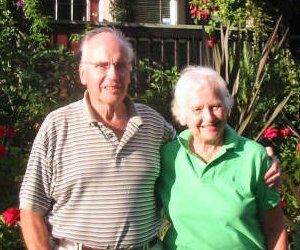 In and out of hospice care, on morphine and oxygen, Mike had his daughter, Sally Green, transcribe his replies. Each session required a great effort and took an equal toll, and there was no possibility for adding questions or refining answers after the initial effort was made. He continued the work only because it was important to him to have one last conversation with the world of science fiction before he died. C. June Wolf: Hi, Mike. Thanks so much for agreeing to this interview. How are you doing right now? Michael G. Coney: I've just been in Palliative Care for two days to try to get the medication sorted out and get rid of the nausea. It went well and I'm feeling quite a lot better now. My appetite has improved, although I've had to get my daughter to type this from my dictation because there is no way I can hit the right keys on the computer anymore. CJW: What led you to become a writer, and to become the writer you are? MGC: When I was a kid I used to read a particular type of writing by H. Rider Haggard, Conan Doyle, Sapper, and H. G. Wells, and I did not realize at the time why I liked this style of writing. At that time the words SF were not in common use. I wasn't at that time inspired to write but I was certainly inspired to read that kind of stuff. The writing came about much later when I was about 40 years old. CJW: What influences have encouraged and inspired you along the way? MGC: Along the way my reading became more general but I still enjoyed most what I was beginning to realize was Science Fiction. The big change came when I read John Wyndham's The Day of the Triffids and The Chrysalids and Cordwainer Smith's short stories. I was encouraged and inspired by these writers, in particular because their writing style was good enough to speak straight into my mind instead of my having to translate each sentence as I went along. I found that their literary style would, to me, stand up against any of the modern books then being touted as good literature. CJW: What made you choose this genre to devote your career to? MGC: I chose SF as a vehicle for writing partly because I have always enjoyed invention. At school I had a basic grounding in science, so I had no difficulty in bending the science that I remembered to fit the circumstances of the story I was writing by the time my writing career started at the age of forty. CJW: What would you say are your greatest strengths as an author? Where have you struggled? MGC: My strength as a writer lies in plotting. I find it interesting to take the disparate elements of a story and fit them together in such a way that I'm left with a story that makes sense and has a proper ending, often an unexpected ending. In order to achieve my effect, I usually fully work out the end of the story first and then work back from it with a middle and a beginning. I have struggled when I have abandoned this method because of the temptation of a good opening idea which I have then written forwards from without knowing where it's all going to come out. The biggest enjoyment comes when I reread the finished story and realize that I could not possibly have written it any better. CJW: Have you ever surprised yourself? MGC: I surprised myself when I wrote The Celestial Steam Locomotive because that was an exception to the above method, when I based the action on puns and a linear progression of action and abandoned my normal method of writing the ending first. I was not satisfied with the result, although I have had compliments on the book. CJW: What are your favourite works—short and long? MGC: My favourite serious novel is Rax (a.k.a. Pallahaxi Tide and Hello Summer, Goodbye ), partly because the book was largely autobiographical and partly because everyone else seems to like it best. Who am I to say they are wrong? Since I write in different styles, I would have to say my favourite humorous novels are A Tomcat Named Sabrina and Fang, the Gnome . As regards short stories, of the serious ones I've always preferred "Sparklebugs and Holly"  because it was a nice, simple love story, and of the humorous short stories I like "Tea and Hamsters." CJW: Clearly both long and short forms attract you. What do you like most about each? MGC: Yes, I enjoy writing both long and short fiction. Long fiction has the attraction of really getting into the story, getting to know the characters and having fun with the plotting. Short stories attract me because there's always the hope of producing a miniature masterpiece with not a word out of place. Examples of the short story I would like to have written are mentioned on my website: "The Gift of the Magi" by O. Henry and Cordwainer Smith's story "The Ballad of Lost C'Mell." CJW: Do you have any favourite or most hated cover art? MGC: I've nearly always been disgusted by my cover art. I did like the naked lady on Syzygy because of the pleasant pastel shades; that was my first cover, but matters went downhill from there on. 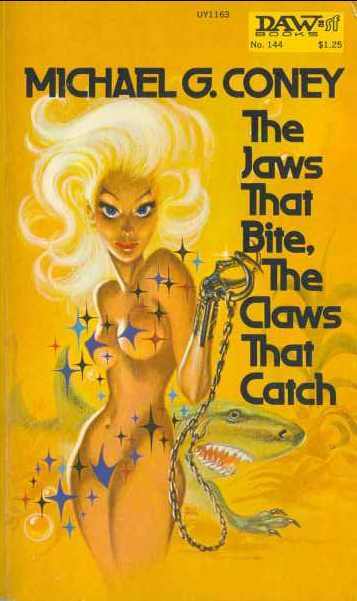 The worst was the DAW cover to The Jaws that Bite, the Claws that Catch . CJW: What effect did growing up in England at the time of the Second World War have on your writing—and indeed on how you see the world? Would you attribute your humorous response to dark situations in any way to this experience? MGC: I was at school during WWII and my only writing was confined to English classes. My reading was supposedly confined to curriculum books. I was taught by a man who had no regard for my use of the language whatsoever and the book chosen as an example of what good writing should be was Silas Marner , more recently voted one of the ten most boring books ever written. That was a dark enough situation to bring out a humorous response in anyone. CJW: I would say you are guilty of intelligent and compassionate lampoonery. For instance in "A Chimp of Few Words," a story which views more than one character with a certain bite, in the end there is no clear antagonist—each of the humans is treated both pointedly and mercifully. What is behind this? MGC: "A Chimp of Few Words" is intended merely to make the reader chuckle. I have however written a number of stories (some of which star the same little old lady) where I have deliberately attempted to show the results of opposing characters' views and tried to point out that each point of view can be correct. My favourite short story of this type is "Sophie's Spyglass" , in which the old lady does not in fact appear. "Sophie's Spyglass" was inspired by my feeling that it is unfair that wives have an insane prejudice against husbands' old girlfriends even though the couple may have been fifteen years old at the time. "Sophie's Spyglass" attempts to work out this dilemma showing the best side of each character in later life. CJW: What do you see as the role of humour in your writing? MGC: When I'm working out the basics of a story (and as I've said the end comes first), that ending may have a particular resonance. It may be simply a joke as in "Chimp" or it may be a trick ending. It may be an ending that is so unspeakably horrible that I have to make a joke of it. So when I start the story from the beginning I'm careful to give the reader clues that this is in no way meant to be taken seriously. Sometimes, on the other hand, I will write a funny story simply because I'm tired of writing serious stories. That is what happened with A Tomcat Called Sabrina and No Place for a Sealion , because no reader could seriously swallow a talking cat or a talking sea lion as a valid character in a serious story. Sometimes it's simpler than that, sometimes I just like to write a funny story for its own sake. CJW: You once said, in reference to Fang, the Gnome and King of the Scepter'd Isle , "I believe in doing as little research as possible." Is this a general approach or was it specific to the Arthurian tradition—which is overwhelming in its abundance? The remark sounds potentially lazy or irreverent, but that's not reflected in your writing. Can you say more about this idea? MGC: I may have implied earlier that I do very little scientific research and rely on extrapolations of remembered school lessons. To some extent this also applied to Arthurian stories Fang and King . The Arthurian tradition had been so heavily instilled in my consciousness as a child in England that I was already very familiar with many of the differing versions, and since it is all in any case a myth, I had no compunction in introducing Fang to the legends of King Arthur. I see it as just another legend like all the others but hopefully funnier. CJW: The dust jacket of your early Gollancz editions features a charming bio I gather was written by you. In it you say, "He writes purely as an escape, and believes it provides an infinite field for intelligent entertainment whether it concerns itself with inner space or outer, and for this reason does not favour artificial boundaries within the genre." Would you change this remark in any way, thirty years after it was written, or does it still sum things up well for you? MGC: I think this still applies to me. I still write for escape inasmuch as I enjoy placing myself as protagonist in exciting situations. As to artificial boundaries within the genre, I am now not so troubled about the boundaries as with the genres themselves. I very much dislike, for example, the grievance genre where the writer is using SF as a vehicle to get across their own agendas. From that point of view I'm obviously speaking about inner space, which is not what I would normally write about. CJW: Although you say that you don't write fantasy, you have an affection for fantasy-like worlds and themes which are then rendered into perfectly logical (and consequently richly inventive) science fiction. What is the attraction for you here? Have you found yourself to be misperceived as a writer at all because of your willingness to explore this region of literature? MGC: This is where the fun of invention comes in. I certainly have found some of my books being described as fantasy but this is never the case unless I set out with that intention, such as Tomcat , Sealion and one or two of my short stories. CJW: What is the connection between the Pallahaxi books and The Celestial Steam Locomotive and other books of the Song of Earth series? MGC: The Song of Earth series consisted of CSL , Gods [of the Greataway] , Fang , King , and somewhere in there, Cat Karina . There was no connection with the Pallahaxi books until I wrote the sequel to Rax / Pallahaxi Tide / Hello Summer, Goodbye and I found that the Kikihuahua were the ideal way of explaining the never-fully-explained survival of the Pallahaxi people. CJW: Can you describe the Kikihuahua? MGC: The physical appearance of the Kikihuahuas is not significant since they are able to change their shape according to circumstance. The main thing about them is that they are totally good creatures able to survive any environment and are telepathic amongst themselves and, to a greater or lesser extent, with humans. They are my version of a perfect creature. In Rax I visualize them as something like giant pandas. CJW: For the Kikihuahua to stay with you over so many books and years, they must have had a powerful hold on you—what was the significance of that group of aliens for you? How did they evolve in your mind, and in what way do they reflect your overall view of the universe? MGC: I would not say that the Kikihuahuas have a powerful hold over me. In many ways I have used them as a convenient deus ex machina. They probably reflect my overall view of who is in charge of everything. Since I am not a religious person I cannot conceive of one little old man sitting on a cloud running everything, but I can more easily believe in an alien race with an infinite capacity for goodness. CJW: What would you say are the themes you have most carefully explored in your writing? MGC: I have carefully explored other people's themes and translated them into my own themes when I disagree with the original statement. For instance, my Arthurian myth is quite different from the various other myths that one encounters. I see the Arthurian myths as having a preposterous background which I highlighted by turning it into SF and introducing the gnomes. CJW: You have written a lot of connected stories: Syzygy , Mirror Image , and Brontomek! , The Song of Earth quartet, the Pallahaxi novels—even your short stories often refer back to each other as well. Why is that? MGC: I like to regard my work as a whole thing and if I find that there are elements of a story in Syzygy that I have not perhaps explored in Mirror Image I like to go back and correct this omission. The best examples were perhaps the Song of Earth books which were never intended to be separate novels. It was only when I got the contracts from the publisher that I found that he was expecting two books for the price of one in the case of CSL and Fang . I felt that I had far from exhausted the possibilities of the characters and events so I had no problem in writing additional material and a completely new line of plotting. CJW: Do you always like where your mind has taken you in your writing? MGC: Only once was I disappointed in where my mind had taken me in my plotting. This was in Mirror Image , an early book, which I commenced full of confidence without working out what the ending would be. The result was my spending a needless amount of time and effort in trying to come up with a feeble, Son of God type of ending. CJW: How has writing changed you? Or, what has writing taught you about yourself? MGC: I think that it has taught me always to be completely honest with the reader and never allow myself to take the easy way out for the sake of glib plot device. It's also taught me to avoid cliches in plotting and characterization. MGC: Mike Coney is the Nowhere Man in Fang and King . He is a youthful version of myself in the Pallahaxi books. He is very obviously the young boy in "Sophie's Spyglass" and other aspects of his character appear throughout the books. His wife is in the Pallahaxi books as Browneyes—Drove's girlfriend. She is also a nurse in Charisma . Most frequently, she is the girl who comes to the rescue of the hero when he has screwed things up. CJW: Talk about the work you have online. Any chance of putting HSG up there to keep I Remember Pallahaxi company? MGC: The work online was put there for various reasons mostly described on the website. Due to my sickness they were not books or stories that I had the time or energy to argue with publishers about, or to rewrite. And yet, since I had had interest expressed by numbers of readers about these stories, I could not let them die without giving them an outing. I don't think it would be possible to put HSG on the site because I think this might represent an infringement of copyright, since the book has already been published in hardcover. CJW: You were quite active writing and publishing during the '70s and '80s, then slowed down during the '90s. What were the reasons for that? MGC: I slowed down in the '70s and '80s because other aspects of my life were taking over my interests, in particular, sailing and family history. To some extent, I'd got bored of writing and needed a break in order to get started again. This break would have come about with Tomcat and Sealion but the two books were so completely different from my other style that I suspected I would have difficulty in getting them published locally. As it happened, I had a small publishing company going at the time (Porthole Press Ltd.) and so I published them under that heading on a small scale limited to British Columbia. CJW: What replaced writing in your life? MGC: My sickness has basically replaced writing. I am suffering from mesothelioma which is very debilitating and makes concentration quite difficult. I find that my memory will disappear from one sentence to the next, which may not seem too bad a problem bearing in mind that this is a frequent enough occurrence with me anyway. CJW: You mention in the foreword to "A Chimp of Few Words" that after hearing that the new editor there was not a fan of your writing, you decided not to send that story to Fantasy and Science Fiction even though they had published the previous stories in the series. Are you content with the decision you made not to send that story to F&SF —or anywhere else? What was behind the decision to hold it back entirely? MGC: I cannot honestly say that I am completely content with the decision not to send "A Chimp of Few Words" to F&SF . I can't help but feel that there was an element of "sod you" and also an element of sour grapes. Maybe the story was not good enough and maybe I was acting on this presupposition. It was not the only short story that I held back entirely but it may have been one of the best. You seem to touch readers on many different levels. What is the special quality in your work that has this effect? MGC: The whole matter of The Celestial Steam Locomotive arose out of boredom with standard SF, which up to that point I had written. It was an attempt to write a story in which absolutely anything could and did happen, driven only by the mentalities of the people involved. I felt it succeeded in these terms but I don't consider it an easy book to read and I have had a few adverse comments on it from people who simply don't know what I was getting at. This was why I went on to write Fang , which I knew would be much easier for the reader to follow. I think it's very easy for a writer to get too clever for his own damn good and to forget that his business is to entertain his readers. I've seen it happen to many other writers and now I could see it happening to myself. It was not what I wanted. The subsequent story on the website, The Flower of Goronwy , is an attempt to return to the style and characters of my earlier books and stories including "Susanna"  and add a touch of spice by the use of a truly horrifying heroine, Mistrale. CJW: If you were to write a novel now, what would it look like? What theme, what setting, what mood would it strike? MGC: If I wrote a novel now I think it would turn out to be like Flower of Goronwy . In fact, I think it has done. CJW: I want to thank you for this interview, Mike, and for giving us the opportunities you have to savour the workings of your delightful mind. It's been our pleasure. MGC: Thanks for the opportunity for burdening you with all this stuff. Mike Coney's latest offerings can be found at his website. A bibliography of his work is hosted at http://westshore.bc.ca/booksmusic/coney.cfm. "Tea and Hamsters," The Magazine of Fantasy and Science Fiction , January 1995. Hello Summer, Goodbye was also published as Rax and Pallahaxi Tide in the U.S. and Canada. "Sparklebugs, Holly and Love," The Magazine of Fantasy and Science Fiction , December 1977; Other Canadas , ed. J. R. Colombo, McGraw-Hill Ryerson, 1979. "Sophie's Spyglass," The Magazine of Fantasy and Science Fiction , February 1993. Bruce Gillespie, private communications, September 2005. "Susanna, Susanna!," The Magazine of Fantasy and Science Fiction , November 1971. "In Memoriam: Michael Coney—A Tribute," Mary E. Choo, Lonely Cry Online. "Michael Coney: An Appreciation," Eileen Kernaghan, Locus , December 2005. "Michael Coney: Science-fiction writer whose readability hid inner depths," Christopher Priest, Guardian Unlimited , 1 December 2005. Casey is grateful for the time to write a little fiction and to enjoy the stories of others. It was a privilege to read a few of Mike's offerings this summer and to interview this delightful man in the last weeks of his life. Thanks, Mike. Rest peacefully. Casey's fiction can be found in Tesseracts Nine , and you may find other work of hers in our Archive.